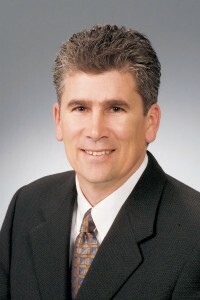 John Lindsay, executive VP and COO of Helmerich & Payne. John Lindsay is executive VP and COO of Helmerich & Payne. He is also a former IADC chairman (2008) and serves on the IADC Executive Committee. 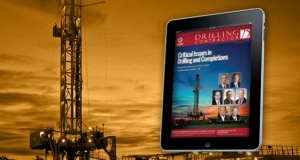 What are the major issues facing land drilling contractors? 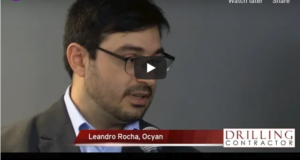 What can the industry do to meet those challenges? The biggest challenge today has to do with key drilling personnel – quality personnel. With today’s rig activity levels and the drilling difficulty in terms of well complexity, approximately 80% of all rigs drilling today on US land are drilling directional and/or horizontal wells. That puts a burden on the employee base, since all of those rigs require directional drillers. Directional drilling companies want to have the best directional drillers they can get, and they’re going to source those drillers – usually the most experienced guys on the rig – from a drilling contractor. Another strain on drilling contractors is losing rig managers, who are being lured away by consulting companies or even, in some cases, by our own customers. That continues to be a challenge. We’ll have to continue to invest in people, find areas that we can attract people into the business, which would include field people and engineers. We need to continue to hire engineers fresh out of school and train them. There are opportunities to attract technicians from different technical fields, whether it be electrical or other types of technicians. There’s a great opportunity to attract people coming back from military service overseas as well. Another challenge is maintaining safe operations, as safety continues to be a major focus in the industry. Data trends for the total recordable incident rate (TRIR) for the US land sector increased each quarter during 2011 over the course of the year, and that’s not the outcome we need. 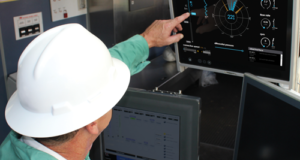 Historically, the industry struggles to maintain an improving TRIR in times of high activity, and we believe the long-term solution is rig safety by design. 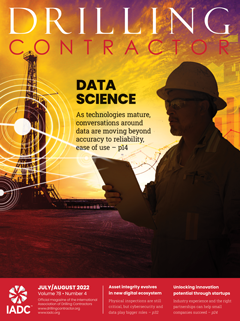 And, finally, with the challenges of personnel and safe operations, the ultimate challenge for drilling contractors is providing value for each of our customers. There’s a technology component that the industry needs to continue to focus on that will ultimately help us to consistently create value for our customers through the cycles. Is our personnel challenge something that we can learn from the past or this a new challenge in trying to attract new personnel? An H&P FlexRig5 works in Pennsylvania. The FlexRig5 maintains FlexRig3’s safety-by-design features while incorporating performance capabilities for longer laterals and deeper wells. 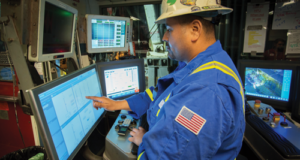 To help maintain safe operations, H&P focuses on designing potential hazards out of its rigs. The company is currently building about four rigs per month. Having quality personnel has always been a source of concern during my 25-year career in the industry, and there is the “big crew change” discussion. The cyclicality of the industry since the 1980s exacerbates the personnel challenge as the industry has received a bad reputation for hiring a lot of people during the up-cycles and laying off a lot of people in the down-cycles, and people remember. As an industry, we have to continue to invest in people, and that means investing in people through the cycles. Companies need to grow their own; they need to teach new employees the business and communicate their respective cultures. If we continue to invest in people, the personnel challenges lessen over time. The challenge never goes away as this business will continue to be cyclical. 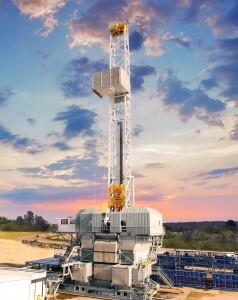 Since 2005, H&P has committed to build 234 new FlexRigs, including 71 in 2011. 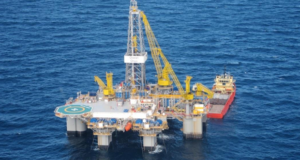 With these newbuilds, and 40 left to deliver as of January, how is H&P ensuring it has competent people for each rig? H&P has a training facility called the Personnel Development Center (PDC) that we instituted in 2002 when we built the first AC-drive FlexRigs, the FlexRig3. In 2002, we set out to build FlexRig3s at a cadence of two rigs per month, which we had never done before, and we recognized a need for a more formal training process. At the PDC, our employees go through various training modules, including safety, leadership training, team-building and technical training over a two-week period. We’ve had more than 5,000 people go through that facility in the last six years. It’s not everything that needs to be done in terms of training; there’s other training that our men experience as they work for the company, but that’s the training that goes along with the newbuild FlexRigs. On average, we have about 20 to 25 men per rig, depending on the crew complement. We are currently building four FlexRigs rigs per month, so we’re training between 90 and 100 men per month. Most of the people we’re hiring are coming into the entry-level positions; however, because we offer a great work environment, there are some experienced people that are attracted to the company. Today’s work force has an advantage over previous generations in that they know and understand computers. We have a very bright work force, and we’re getting a lot guys with four-year college degrees who are starting out as roughnecks, and they’re finding entry into an industry and an entry into what they would consider a good company. We’re excited about it. It’s a great way to get a start, and that’s where the value is created in the industry. The value proposition is not created in our corporate offices; it’s made out in the field and by the people who work on the rigs. Learning the business on the rig goes a long way toward understanding how things are done. It’s instrumental in our ability to understand how rigs can be designed and built better. It goes into the H&P safety-by-design philosophy. How is the safety-by-design philosophy helping H&P approach industry’s challenges? Left: New-hires participate in a training course on an ST-80 iron roughneck at H&P’s Personnel Development Center in Houston. About 5,000 people have completed training at the center since 2002. Right: A FlexRig3 works in Pennsylvania. FlexRigs have pioneered the use of AC variable-frequency-drive technology in onshore drilling. From a contractor’s perspective, we have to design and build better rigs. We have to design rigs that have safety by design, allowing us to design out a lot of the hazards that existed in older rigs. Legacy rigs have hidden traps, and people continue to hurt themselves in the same way because of the older designs. An improved work environment goes a long way toward attracting better people. Roughnecking is still a difficult job, but it’s not nearly as difficult if you’re not doing as much manual labor or out there getting hurt. H&P has had an engineering training program since the ’70s, where an engineer would begin their career with the company as a roughneck, and I’m one of many who entered that program over the last 35 years or so. Unfortunately, several of the engineer trainees, including myself, suffered minor injuries as roughnecks – smashed fingers and stitches working on old, conventional SCR rigs. Those experiences are among many factors that enabled us to design a safer rig. Safety by design has been very strategic to much of the success we’ve had in our safety improvements and FlexRigs. We’ve made strides in safety, but you noted that TRIR numbers have gone up in 2011. Does more need to be done to prepare new-hires to be safe and to reinforce safety practices among industry veterans? 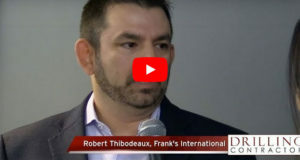 Any time in the industry that we’ve seen a large increase in activity, typically you see an increase in the number of accidents, and the TRIR goes up. As an industry, we have to continue to invest in safety by design and better technology solutions. Training is a very important aspect of what we do for safety and what we do with new employees and new employee indoctrination. However, safety by design, investing in more technology solutions, improving rig designs – that’s really the best investment you can get for your money. Training, as important as it is, is really the least effective means of preventing injuries. The best solution to prevent injuries is to remove the hazard altogether – designing the hazard completely out of the rig or out of the piece of equipment you’re working with. That’s the most effective investment that we can make. Don’t get me wrong, training is very important, but it’s much more effective when employees are working in a rig environment that employs safety by design, during the design phase of the rig. 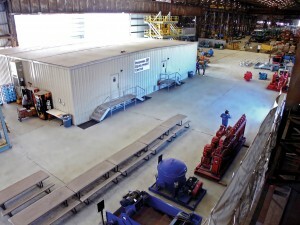 An AC-drive FlexRig5 sits in the Houston rig-up yard before being transported to the rig site in Pennsylvania. The FlexRig5 follows its predecessors FlexRig3 and FlexRig4 in its safety-by-design features. Since 2002, H&P’s FlexRig3s have accrued approximately 30 million manhours while averaging a total recordable incident rate of 1.15, compared with the industry average of 5.15 in the same time period. We built the first Flex3s in 2002, and we’ve accrued close to 30 million manhours. From a rig activity perspective, that’s approximately 500 rig years of activity since 2002. The average TRIR over that time is about 1.15, compared to an industry average of approximately 5.15 over the same period. The industry has invested literally millions of dollars in training people, but the bottom line is that a rig that has a better design criteria with many of the safety hazards designed out of it is inherently a safer working environment. Your training dollars go further. 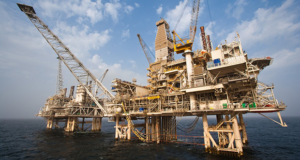 Finally, another key ingredient in attaining safety success requires leadership on the rig to create a working environment where employees are empowered and obligated to stop the job when they believe there are unsafe conditions. What are some of the features of H&P’s latest AC-drive FlexRig5? 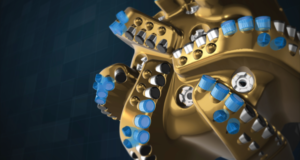 With the Flex5, we set out to preserve the key drilling performance features of the FlexRig3 and incorporated a lot of the experience we had from unconventional shale plays where we have been drilling longer-reach horizontal laterals. The FlexRig5 is designed for a pad drilling application, where customers are typically drilling six to eight wells but sometimes as many as 20 wells on a pad. Pad drilling enables multiple wells on a single pad without having to rig the rig down with trucks and move it to the next location. The Flex5 design criteria resulted from customer feedback. It’s a larger rig than the Flex4S pad rig that we designed in 2006, targeting longer laterals and deeper measured-depth wells while preserving the safety-by-design features and the drilling performance associated with the Flex3. What technology gaps still exist, and where do you see the industry heading in the future? A majority of rigs that have worked over the last 10 years when the industry’s TRIR averaged a little over five are conventional, legacy-type assets. They are rigs that were built primarily in the ’60s, ’70s and early ’80s. Those rigs clearly have a technology gap, but then you have the advanced-technology rigs, AC-drive rigs, that are in a completely different class. 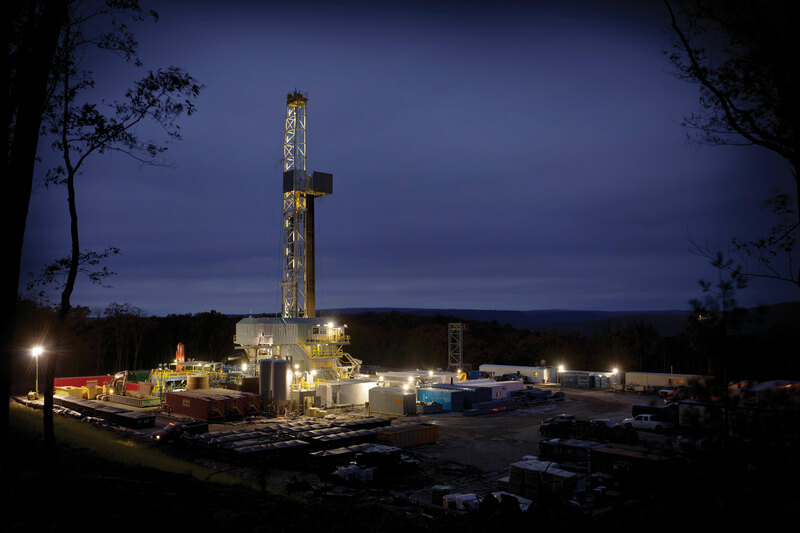 There are approximately 2,000 rigs working today in US land. Approximately 40% of those are mechanical rigs, 35% are SCR rigs and 25% are AC-drive rigs. In those classes of rigs, there are distinctly different technologies. The mechanical rigs are on the lower end of the technology spectrum, the SCR rigs are in the middle, and the AC-drive rigs have the best technology today. With the technology gap on the lower-end rigs, the older fleet is effectively reaching an obsolescence factor. 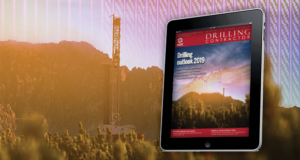 It’s going to be hard to apply the down-hole and surface technologies that we’ve seen as beneficial to drill the types of horizontal wells that are being drilled today. You can put a top drive on a mechanical rig, but it’s not nearly as effective as having a top drive that is integrated into the mast on an AC-drive rig that has PLC controls and an integrated operating system. The cost-per-foot difference demonstrates there’s a dramatic difference. H&P sends its rig crews to its Personnel Development Center in Houston for two weeks. 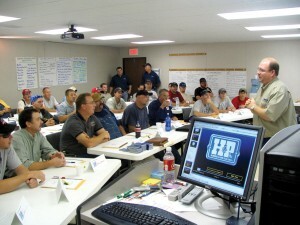 Since H&P is producing about four FlexRigs per month, about 90 to 100 crew members are being trained every month. As industry looks to recruit additional personnel, there are opportunities to attract technicians from other technical fields, as well as people returning from military service. Our customers and other operators are beginning to shy away from the older rig technology and investing in new rigs and are willing to commit to multi-year contracts. Will automation become more present in the designs? I would classify what the industry has done to date as more related to mechanization. We’ve replaced spinning chains and tongs with an iron roughneck, and we’ve added hydraulic catwalks and top drives. I think there is automation potential in the future, but I don’t think that will be possible unless you have AC-drive technology on the rig. I think the digital downhole data that we’re able to obtain with AC-drive rigs will eventually allow us to do more in an automated way, but we’re probably still a couple of years away from being able to do that. There’s little doubt as we leverage more AC-drive technology that we’re going to be able to do more in the way of drilling efficiency. I think it’s more of an innovation process over time. We’ll find better ways to utilize the data to automate certain functions. What challenges or opposition do you think the industry will have to overcome in regards to hydraulic fracturing? How are environmental regulations affecting business? H&P doesn’t have a pressure-pumping business, so we are not as involved in this debate as others, but there’s no doubt that it is a concern for the industry. If people believe it is impacting their drinking water, that is a serious allegation. I think it’s obvious that it is difficult for the public to get the hard facts from the media. I believe the industry is being more transparent, more communicative with the public and the regulatory bodies, and that is the right thing to do. There’s so much information out there; it’s hard to tell where the facts begin and the fallacies end. I believe there will continue to be opposition to hydraulic fracturing, but I also believe the facts are on our side, and the industry will manage through this. 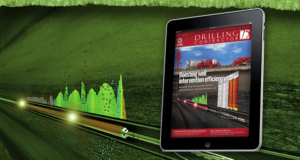 From a drilling rig perspective, we have taken an environmental initiative by design. 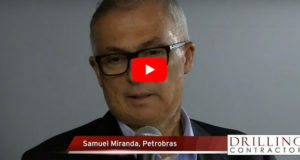 As an industry, we have to continue to work on being proactive – whether it’s rigs that have a smaller environmental footprint, rigs that move less frequently, require fewer trucks, less emissions, having engines that are more emission-friendly, rigs that contain drilling fluid effluent more effectively … I think all of those things are very important. We can demonstrate to local communities and to regulatory bodies how much safer and environmentally sound we are today than we were five or 10 years ago. Are we perfect? No, but look at how much safer we are. And look at how much less emissions we have and less environmental footprint we’re leaving behind. We are getting better, and we are striving to continue to get better. We just need to get better at a faster pace. With the influx of new-hires to the company, the H&P Personnel Development Center was set up as part of a formal training process that includes modules on safety, leadership, team-building and technologies. How can the industry sustain its level of activity even with the low natural gas prices? The low gas prices affect our drilling activity, but since oil prices have remained above $80 a barrel for the most part since coming out of the downturn, we have had extraordinary rig activity levels. If you were to look at the previous 15 years of my career, a $3 natural gas price would have meant a whole lot of rigs being stacked. But with the unconventional oil and liquid-rich plays, oil prices above $80 and bifurcation of the rig fleet, the industry has derived completely different drilling economics. 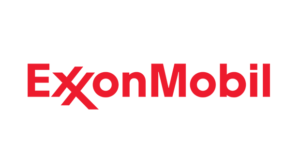 Our customers are able to make money in this commodity price environment, and the economics are conducive for drilling contractors to invest in newbuild rigs.